Halloween is up in the foyer.. 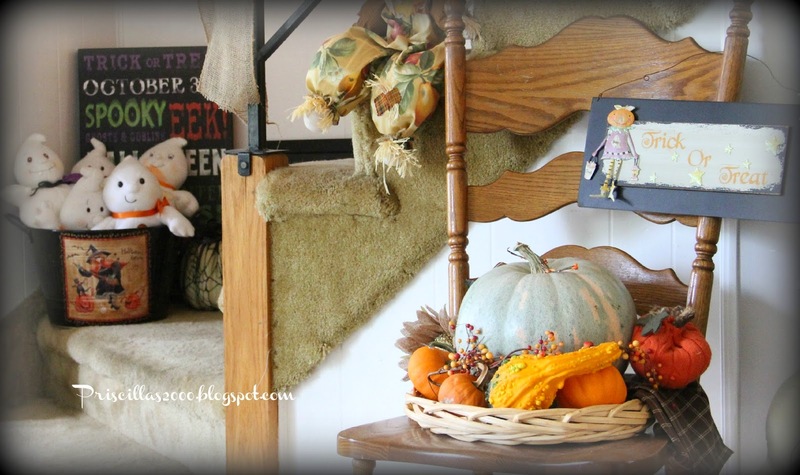 There are ghosts , pumpkins and gourds and of course cross stitch !Leaf garlands with white lights and burlap bows hang on the stairs. There are little wood Halloween signs all along the garland. 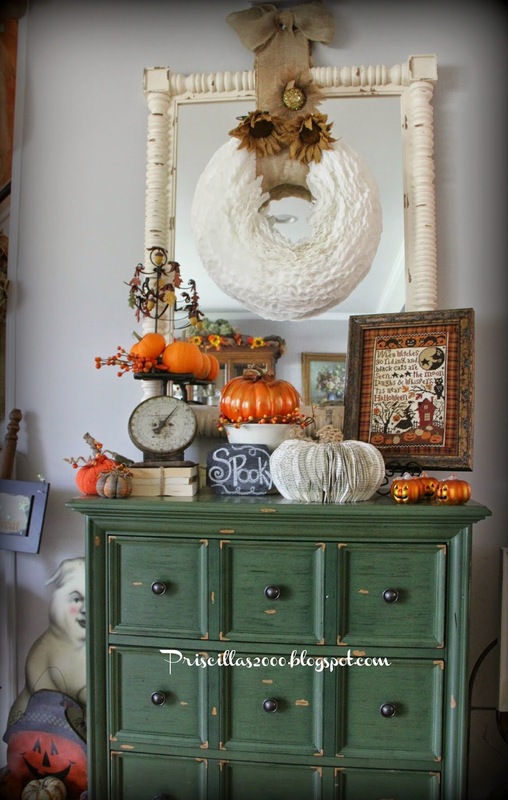 Chalkboards,thrift store baskets,and a vintage scale with pumpkins .. These ghosts are from Hallmark , along time ago .. There are 5 ..one for each of my kids.. all in a witches bucket. Behind it is a Halloween subway art . 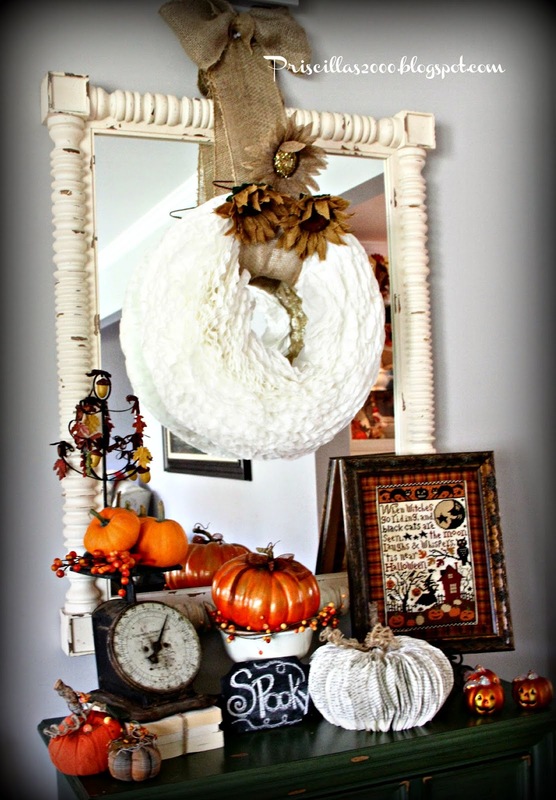 The coffee filter wreath hangs on the mirrow with burlap sunflowers for an accent on the burlap ribbon for hanging. 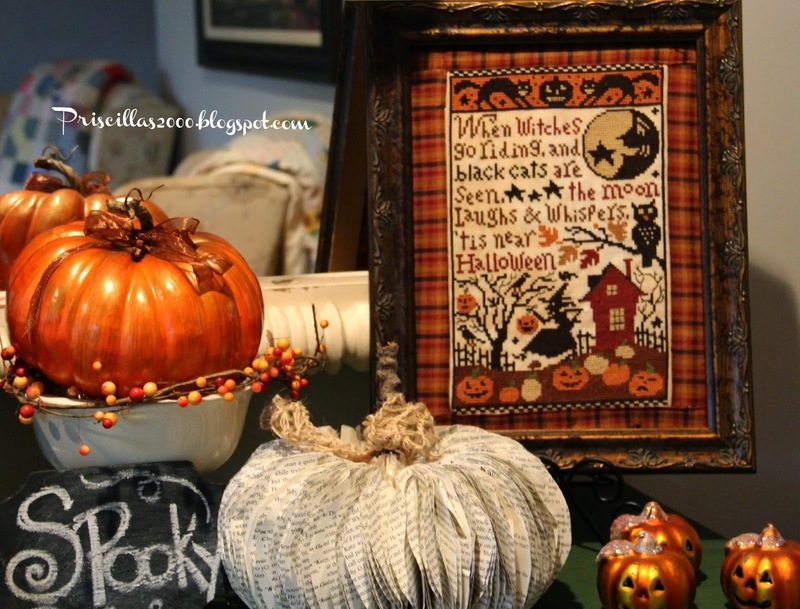 On the chest ..a stack of old books..vintage scale ..pumpkins..bookpage pumpkin and one of my favorite Halloween stitched pieces from Prairie Schooler..
A wicker basket from Good will holds real pumpkins and gourds and a sweater pumkin with berries and a burlap sunflower. 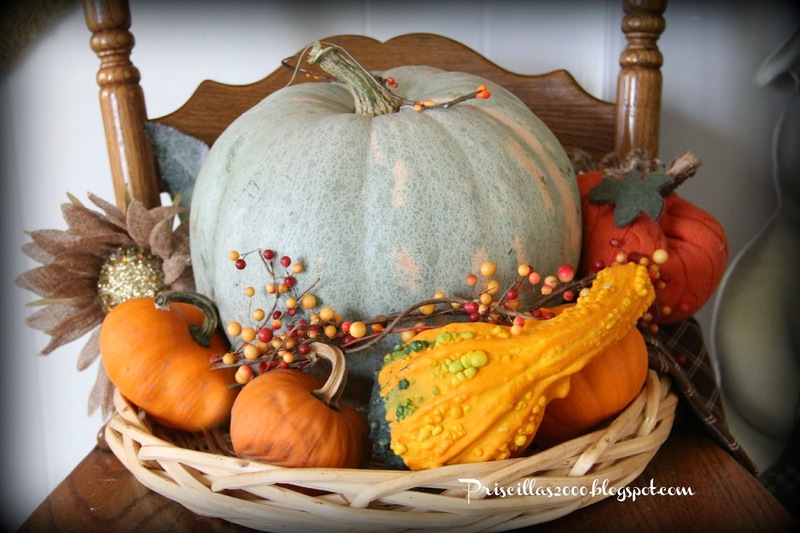 The wrought iron tiered basket holds pumpkins and gourds and a fall chalkboard. Currently I am trying to get Lizzie Kates Tingles all stitched into one piece .. I have the perfect idea to frame it and I am hoping to get it finished before Halloween ! I also have another Santa from Prairie Schooler underway . Another wonderful arrangement in your home.. The five ghosts are so cute in the container.. Your garland is beautiful with the lights.. I know it is amazing at night.. 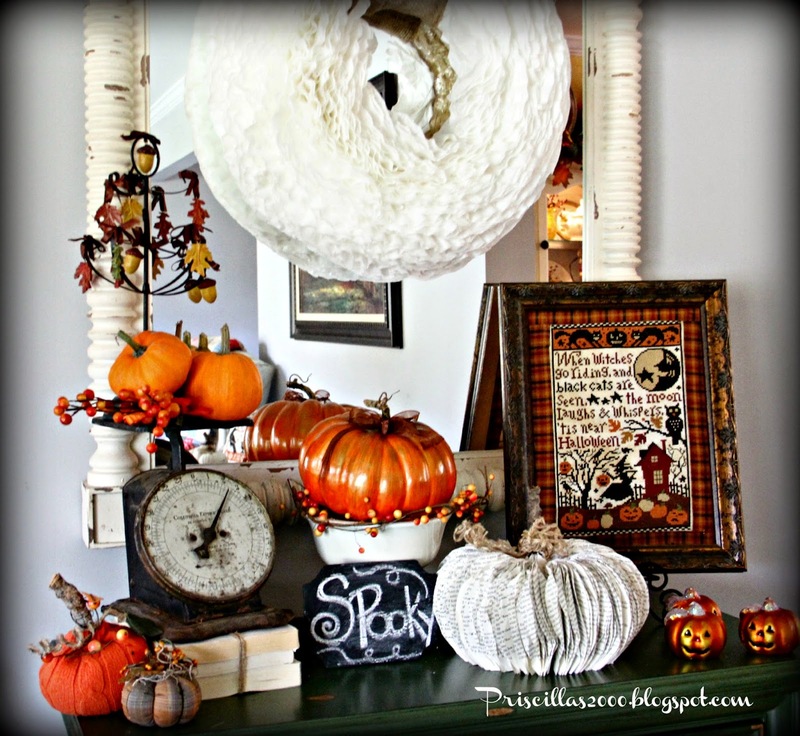 Thank you for sharing your home's décor..
WOW, I love how you decorated your home for halloween. You're the best. So fun and welcoming!! I love the way you frame seasonal things. The PS is just perfect! 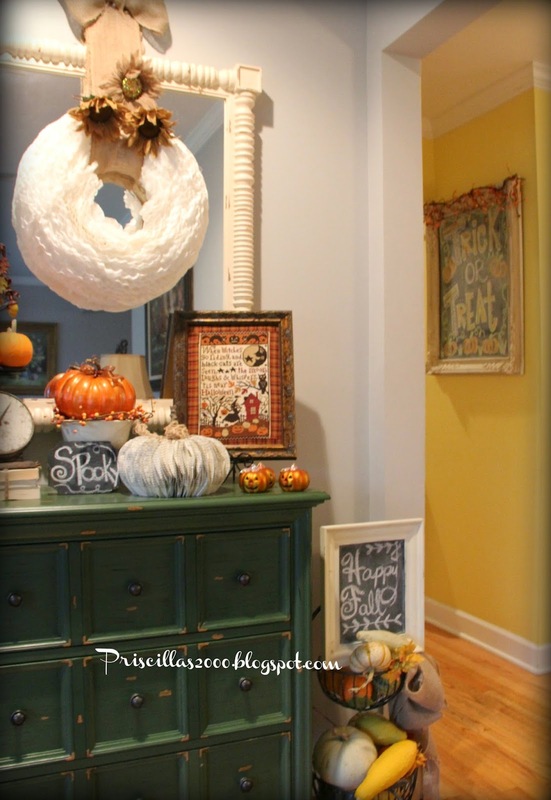 I just adore that PS Halloween piece, Priscilla! 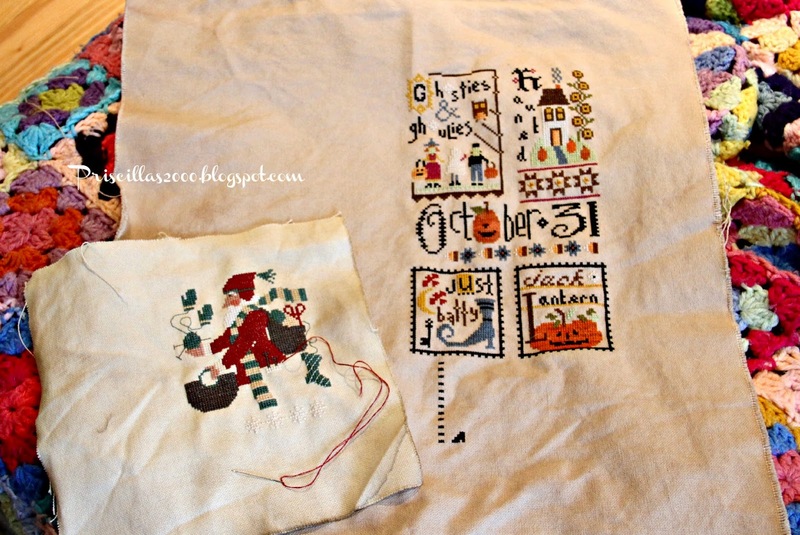 I hope to stitch mine one of these days :) I seem to be caught up in Christmas stitching most of the year anymore! Hi Priscilla. It all looks so great. What fun. I bet the grands love to cometo Grandmas house! 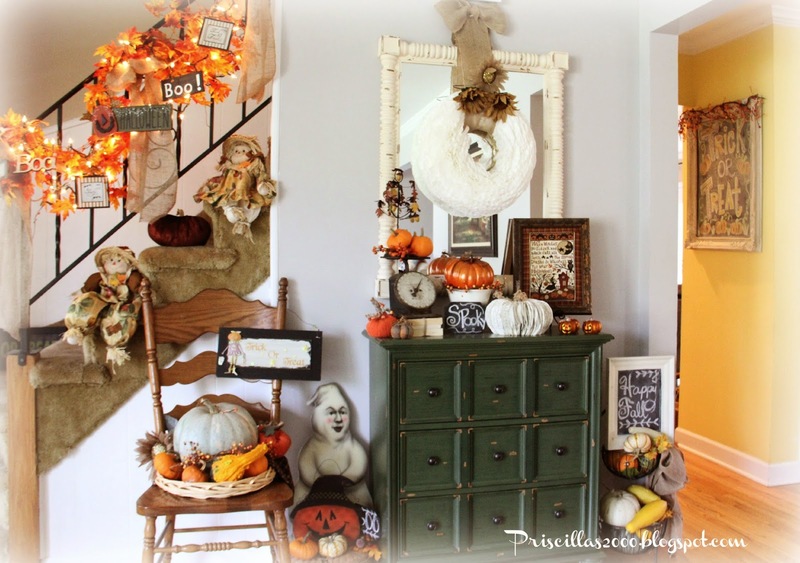 You must have a basement to store all of your decorations!!!! Fall has finally arrived with some much cooler temps. Still too warm for my tastes, but hey, I will take it!! Looks wonderful! 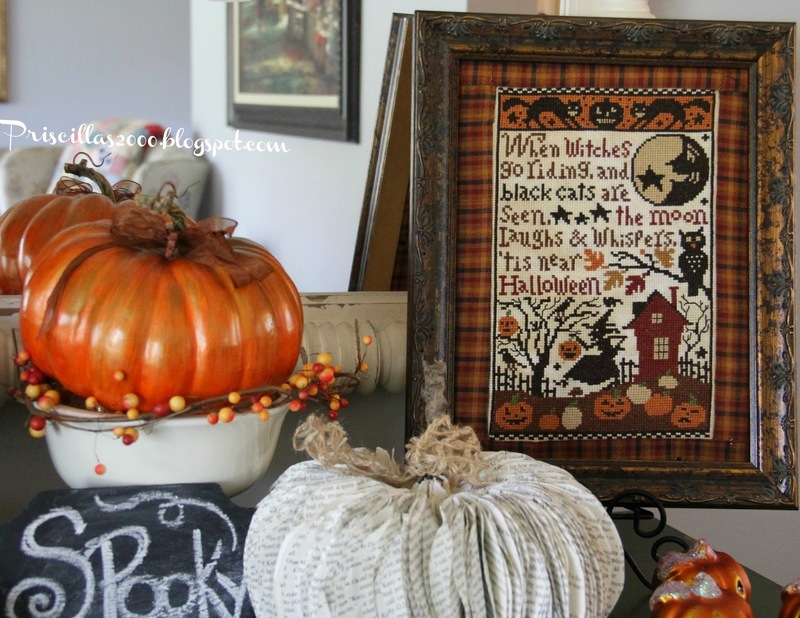 Where could I find the Halloween cross stitch picture..I love it! Always love each and every little detail Priscilla! 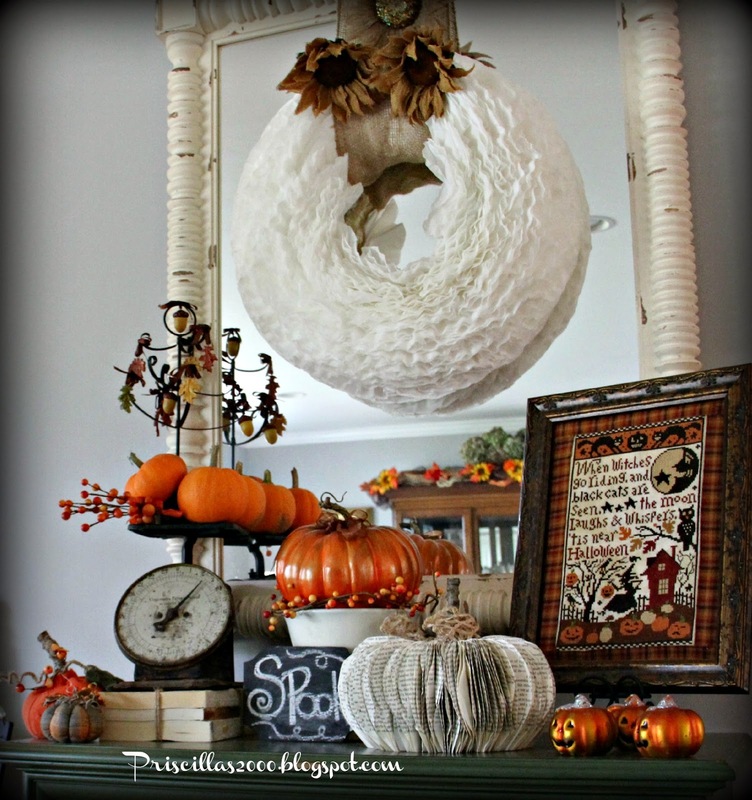 Your wreath is so pretty and that is an amazing stitching!! Thanks for sharing with SYC. So much fun! I love all your wonderful decor. I can tell your house is the place to be! I love it! Oh, I just love what you've done here. Everything looks wonderful and fun. 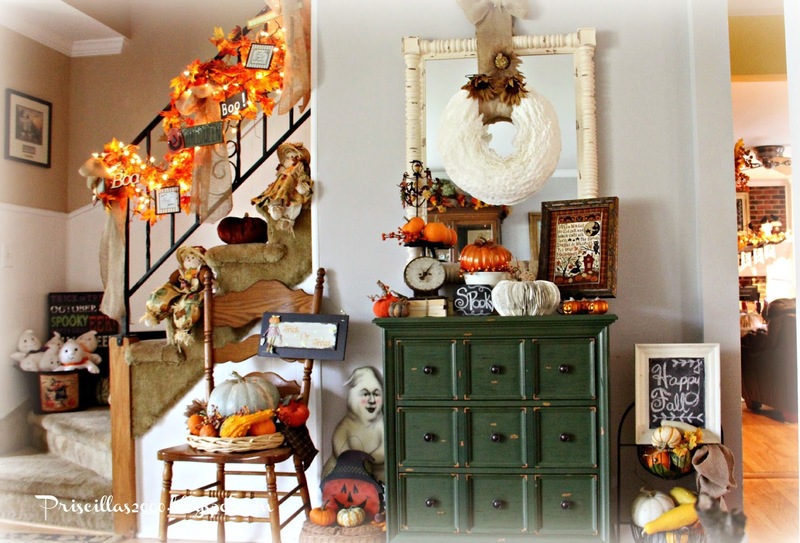 I love your foyer and how you mixed the faux and real pumpkins. I like to do that myself. That green cabinet is fabulous. I want one. Such gorgeous detail and fun!